In early 2010, an agency based in both Atlanta and the Los Angeles area, approached FSI to support their growing sweepstakes and rebate programs for their top client. Their current provider, an Atlanta printer, was not flexible enough to handle the substantial growth of programs and the volumes within each promotions. Rebates checks were going out late and incorrectly while the number of on-going programs with overlapping date ranges proved too much to manage. Another factor became lack of technology to manage the programs giving no access, for the agency or client, to the data they desired. Already providing similar services for companies such as Pepsi, ValPak and Turner Broadcasting, FSI was definitely up to the challenge. FSI worked with the agency team to understand the full scope of the current promotional programs as well as define areas they wanted to improve or expand upon. We also studied workflow as well as planned and projected growth so we could develop a solution that would be expandable enough to support them well into the future. 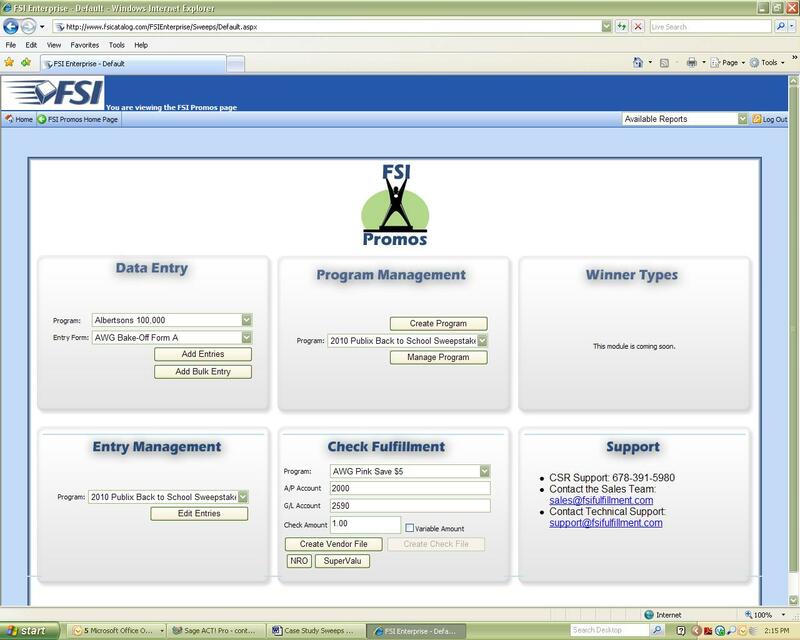 Based on a system developed exclusively by our IT Team, called FSI Promo, we adapted existing capabilities quickly to not only allow our Account Reps to set up their own data entry screens simply and easily, but to portray the data in a set of standard reports available to the agency and their customer via the web. The results were amazing to our client, who typically had to request manual reports from their provider and possibly wait a week before receiving them. Data is now available to users 24/7 via an easy to use web portal including sweepstakes entries; all data for remarketing purposes, winner information and rebate check data. Every report can be downloaded into Excel format for further data mining as needed. FSI started supporting this customer with 10-12 rebate and sweepstakes programs. Programs grew to our managing over 30 Post Office boxes, 3 web sites and a variety of 37 sweepstakes and rebate programs for this client. Additional programs soon came to include the WalMart NRO program where FSI receives requests directly off a toolbox website via web services. Our IT Team wrote an API web service specifically to manage check data including multiple checks for multiple store locations. Checks are made payable to major charities on behalf of stores that place qualifying amounts of products. During this programs’ run, FSI sent over $500,000 in donation checks to charities such as Children’s Miracle Network and Victory Junction Gang on behalf of WalMart stores and the client Sales reps.
FSI also provided a variety of support service to the client in placing POP/POS materials into retail stores. Signs, banners, window clings and shelf talkers are designed and produced by the agency, and FSI distributes these to retail and to NRO reps for store placement and installation. We also carried hot dog carts, premium items and other merchandise used in store promotions. FSI continues to develop new ways to approach and manage sweepstakes and rebate programs in our effort to be the top provider of these services in the Atlanta and Southeastern market.